The calendar page has turned to December. The month will be about shopping, baking, decorating, holiday concerts, and social gatherings. I was curious about how artists have interpreted Christmas through art. So in my usual way of diving down the proverbial rabbit hole I found some wonderful images to make my plunge interesting. I have to thank Dr. Rita Coen at St. Cloud State University for my love of art history. Dr. Coen was my art history professor back in my undergraduate years. Yes, she was the mother of Ethan and Joel Coen. There is still something so epic about the Renaissance artists who depicted the Nativity in such glorious and flamboyant compositions. 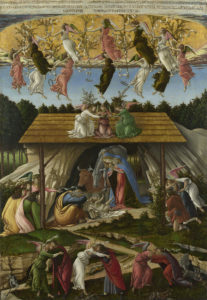 Christmas was all the rage for painters like Botticelli and Leonardo. I still have to stop and enjoy the cards that come to the house that use their images to wish me happy holidays. The cards, like the paintings are glorious. 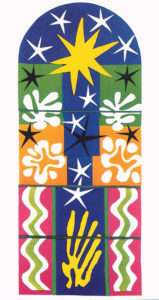 With a nod to contemporary Matisse creates with an explosion of colors and stars. The painting was intended to be a stained glass window that was never completed. Matisse’s interpretation of Christmas eve is still as glorious as Botticelli! Matisse wrote, “I would like to accomplish that people who are tired, strained, broken may find rest and peace in my paintings”. I think the Renaissance artists could have said the same thing in the 1500’s. Who knew that Dali created his own Christmas cards? He created series of 19 cards for a Barcelona card company. The imagery he used in these cards were a detour from the drippy clocks and odd images. 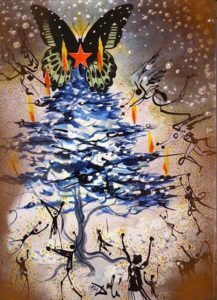 Dali made use of American and Central European elements, such as the Christmas Tree, which was very much a Spanish tradition at the time. There are only a handful of these cards created in 1960. Artist Banksy isn’t exactly one to let a chance for political commentary. 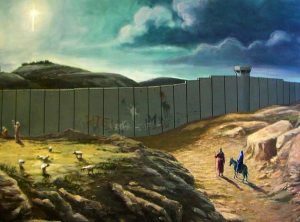 Another image for a Christmas card, Bansky shows Mary and Joseph’s passage to Bethlehem being blocked by the infamous wall that separates Israel from Palestine and the West Bank, creating unsettling parallels between Mary and Joseph’s refugee status and today’s refugee crisis. Thanks Dr. Coen for sparking my curiosity in art history!